Stamp a Little Love Baby! : OCL Blog Hop! Too sweet. Love the ornage boots! Oh look at how CUTE that little groundhog is peaking out of Granny's garden!!! CUTE card!! Oh, this card is so cute. I love all the images that were used on this card. Thanks for sharing. 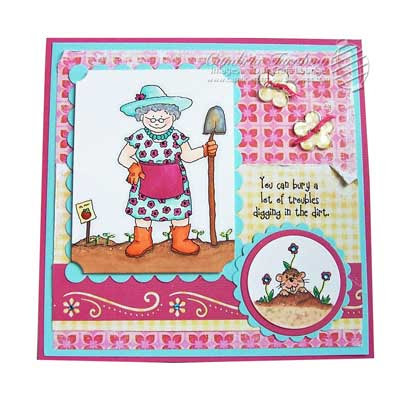 Hey there Campin' Cams...love your Granny card and all the details you added! SO cute, Cami! Love that little gopher peeking out! LOVE Granny, Cami, she looks so pretty in the soft colors! A-DOR-A-BLE! Love me a Cami card! Oh, just adorable! Granny is so cute and that gopher, love it! Great papers and coloring--love the gopher! This is a great set Cami! LOL Wasn't sure you still knew you had a blog! Great to see you back on here. This is so adorable and just love the stamps. THis card makes me happy and sad at the same time- LOVE everything avout it- the colors just SCREAM Spring/Summer...THen I look outside at my gloomy overcast weather and wonder - Will we EVER get some sun??? Thanks for the cheerful dose of sunshine! The gopher is so darned cute, now I must have the set. This card is so adorable! I love the colors, too! Cami, I miss seeing you - will remedy that soon! As always I draw inspiration from you and your creative ways! Granny is now on my must have list!!! Granny is sooooo cute! Love your coloring, papers, etc. Would love to win some candy!! Great paper to go with Granny! What a fun new stamp set! 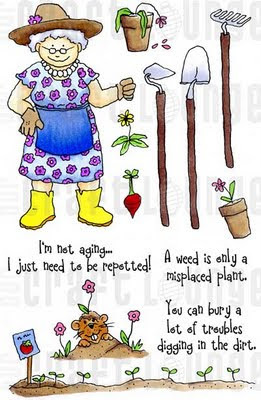 this is adorable and Granny's are always cute. Tooo cute!! Love granny with the little groundhog!!! This is simply ADORABLE Cambria! LOVE IT!! How cute that little groundhog is peaking out of Granny's garden!!! Cambria, Love your blog and hope you are doing well. You are such a lovely person, and so kind to share your talents with us. Be well. Christine T.